Basil and Maria Toutorsky's home on 16th St., Washington, D.C. 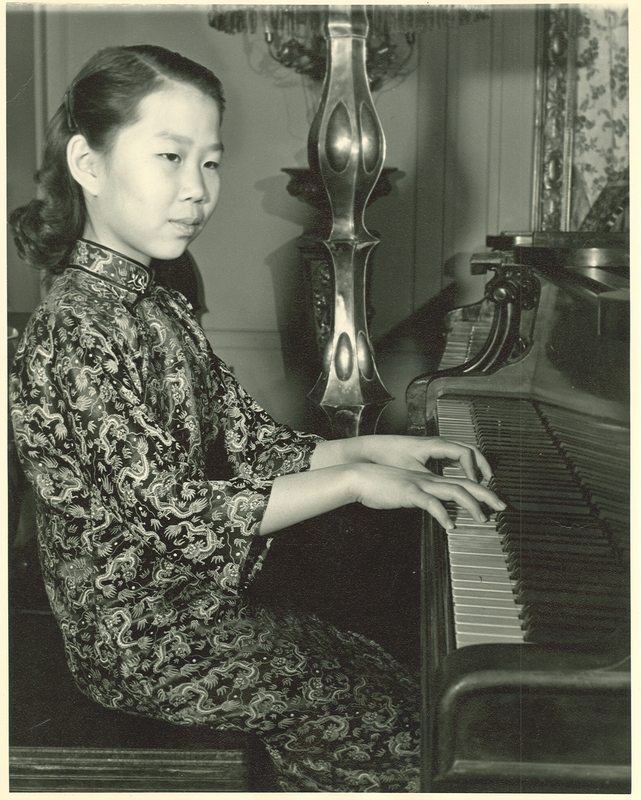 I started playing the piano when I was three in China trying to imitate my Aunt Anna, a piano teacher. When my father was finishing his doctorate at the University of Chicago, he sent for my mother and me to come to America. We were living in Peking with his parents until the end of World War II. We travelled by freighter for three weeks, arriving in California. Then we took a train to Chicago, five days sitting up in a train, eating sardines on saltines for our meals. Our first home in Chicago was located in the cement basement of a house belonging to a Chinese family who kindly took us in. When he graduated, my father got a research position at the U.S. Geological Survey in Washington D.C. and we moved to a 2nd story apartment in a small house in Berwyn, Md. Piano was important everywhere we lived. We had an upright in the Chicago basement which I would practice after I had started the evening’s rice to cook. In Berwyn, we also had a piano. That’s when my parents found a piano teacher named Mrs. Cortez to give me piano lessons. We stood by the highway and took the Greyhound bus to Washington, D.C., then took the D.C. Transit bus to 16th Street for my piano lesson. Sometimes my father would drive us there, reading scientific papers in the back of our old black Ford while he waited for me to have my lesson. Soon, Mrs. Cortez suggested that I take lessons with the Professor instead. She was a student of his as well, her teaching room right off the reception room filled with sumptuous furniture. Before leaving Russia, Professor Basil Toutorsky was a renowned pianist and friend of both Sergei Rachmaninoff and Alexander Scriabin. He was also one of the nicest persons I had and have ever met. He took me under his wing for about four years from the time I was eight to when I turned twelve. 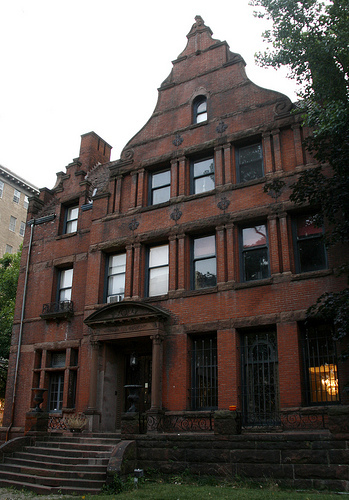 The architecture of the house on 16th street made it a landmark in Washington. Click studio to see the outside and imagine what it must have been like for a Chinese kid to have piano lessons there. Inside, there were twenty-two grand pianos, placed two-by-two with keyboards that ran from one end to each other. Some were coved together as matched pairs in room after room. We spent many hours playing four-hand pieces together, either on one piano, sitting side by side or on two pianos where we could see each other over the music desks. By osmosis, this early routine of playing with Professor Toutorsky gave me a deep sense of music and rhythm. He taught me laborious hand and finger exercises that gave me strength and independence. I played a lot of technical exercises: Czerny, Cramer and lots of scales: chromatic through the circle of fifths, natural, in parallel and contrary motion. I later learned that the finger exercises were known as the Leschetizky method. To this day, I owe the development of my technical ability, ear training and musicality to Professor Toutorsky. He was also one of the few adults who showed me humor and compassion. One year for my father’s birthday, he recorded me playing Beethoven variations and encouraged me to say “happy birthday” on the ’78 rpm record that he put into a paper sleeve. When I was twelve, he took me down to the Cosmos Club, an exclusive place where concerts were attended by Washington’s society elite. It was the first time I played a few notes on a nine-foot Bosendorfer grand piano. The tone of the Bosendorfer’s bass notes made a lasting impression on me. Later, I compared its tone to many of the instruments that I played, looking for that elusive and rare depth of sound. He also planned my first recital to be given at his home. 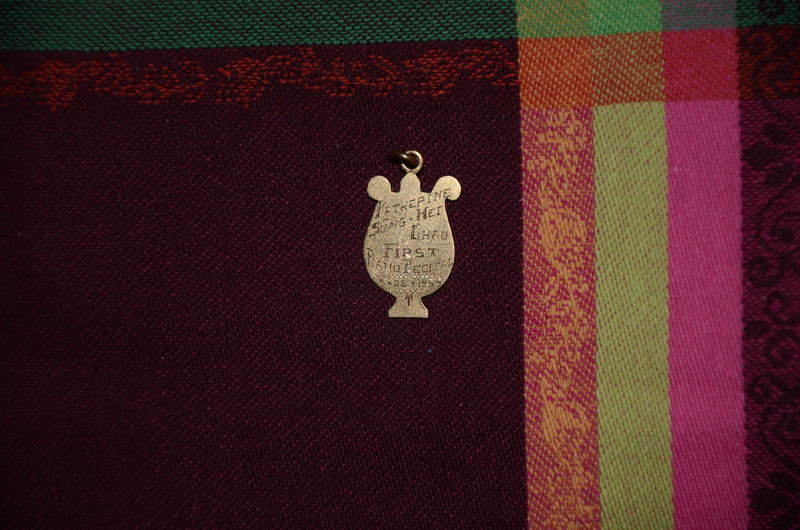 As a momento, he showed me a photo of a music lyre in the Encyclopedia Britannica, and then with my assent, had the image of the lyre made into a gold pendant, engraved on the back with my name and date commemorating my”First Recital”. To this day, I am ever so grateful to this gentle man who gave me so much technical and musical training so magnanimously. My parents underestimated what he did for me. I don’t think they knew what Leschetizky method was. For sure, they didn’t realize how much Professor Toutorsky cared for me. Nor I for him. by freighter! . . . to travel between continents by sea – just a dream to most of us nowadays. Really does seem like the way to do it, though, especially to anyone courting soul changes. . . . I myself travelled between continents by sea on a troop carrier the Marine Carp from Greece to New York in 1946 after the war ended. After the horrible experience of Atlantic storms I took an oath that I would never place myself in such a situation again in my life. Thanks for your comment, Helen. It seems you came over to New York on the Atlantic Ocean, and I travelled a few years later to California on the Pacific Ocean. I’m so glad that we have had an opportunity to meet each other so many years afterwards on the New England coast. Lucky you! For a few years starting in 1984, I was also privileged to learn from Professor Toutorsky. He was a wonderful, gentle man whose method of teaching just seemed to strip away your fears and anxiety. He so enjoyed the personal relationships that he had with his students, and I will always remember him as the one teacher who taught me the very most of any others. He was easy to learn from and it was enjoyable to practice what he taught. I also knew his wife who was Mexican, also very sweet, and worked sometimes in the garden of his backyard. It’s a pleasure to know that someone besides me even knows who this great man was. I have a clipping that was printed in the paper upon his death, and a copy of a piece of music he wrote and had printed, I believe entitled “Waltz”. I also have, and still cherish, a two page “How to Practice” guide that has been invaluable to me over the years. The house was, indeed, quite grand! I remember one of his pianos was owned by Franz Liszt. The home has since been bought and is now operated as a bed and breakfast, but apparently is very lovingly cared for. You can look up “Toutorsky Mansion” on Google, and you’ll eventually find a site where there are several photographs. Maybe you can take a trip down memory lane as I did. Nothing but fond memories. Thanks for your comment! If you click on the mansion in the text, it will bring you to the photo of the house on 16th street. Did you also know that there is a scholarship fund in Basil and Maria Toutorsky’s memory at the Peabody Institute at Johns Hopkins? They sent me a brochure with photographs of the Toutorskys even in their last days. You might ask them to send you a copy too! Wonderful, Katherine! Thank you for sharing this. Congratulations on your new instrument, Gale. The playing is the long-term investment. The music is everything. That we can make it ourselves is a gift from the Cosmos. I’ve read good stuff here. Definitely worth bookmarking for revisiting. I am surprised at how much effort you put to create such a great informative site. Thanks, Cyrus. Professor Toutorsky was one of a handful of the most influential people in my life. Not only did he provide me with a disciplined approach to studying the piano but how to be generous and giving to others as a human being. To this day, I can sit down and play anytime because of his training. There is a scholarship fund at the Peabody Conservatory (Johns Hopkins) named after Professor Basil and Maria Toutorsky. I, too, was privileged to know both Professor Toutorsky and his charming wife, Maria. Not only did I enjoy the opportunit of studying piano with him, I also put in many happy days and weeks helping to refurbish the outstanding woodwork in the interior, including the dramatic grand staircase with ithe hand-carved griffin newel posts and the 12\’ tall pocket doors between the two-story entrance hall and the double drawing rooms on the main floor. It was my honor to design and install the walled formal garden at the rear of the house, complete with a central round limestome-curbed fountain and symmetrical beds planted with seasonal bulbs, pea gravel footpaths, shrubbery, trees and comfortable benches placed strategically to exploit the best views as a save place for the Professor and Madame Toutorsky to stroll outdoors, since their home was only one block off the then notorious 14th St NW corridor and the fact that the sidewalks in their neighborhood were rather uneven, due to the upheaving of the pavement by the large street shade trees and the Professor was not all that steady on his feet. We even had the existing brick wall raised to 10 feet tall and added broken glass in the cement on the top to discourage intruders. I wonder what to do with the copies of the music Professor Toutorsky himself composed and so kindly presented to me, now that I live without a piano. Hi Ethan, thanks for your lovely comments about Professor Toutorsky. Did you know there is a scholarship fund in their names at Johns Hopkins Peabody School of Music? Perhaps they would be interested in the scores that he gave to you. I took voice lessons at the academy from 1962 to 1968 and our recitals were in a second floor room. This may sound strange, but I had an enormous crush on Professor Toutorsky. His photo hung above the piano in the little parlor where we waited for our lessons (my three sisters and I) and I thought he was the most handsome man I had ever seen. His wife, Maria, was gracious and they were both very kind to the students. Some of my fondest memories were of them. Thanks for your comment! how old were you when you had a crush on Professor Toutorsky? I took lessons from him in the 50’s and he was already pretty old (to me at least) then! Actually, he was in his sixties when I was there but his photo was so handsome in his Russian uniform. I was 12-18 years old. Basil Toutorsky was a true gentle-man. What a privilege to have known and studied music with him! He was the most caring person I knew growing up. . . which says a lot, doesn’t it? Dr. Basil Peter Toutorsky and Mrs. Maria Toutorsky were the most beautiful people on earth. I had the remarkable privilege to study under Dr. Toutorsky from 1985-1987 in his historically home studio on 16th Street, NW, Washington, DC. Each visit was engaging, comfortable, and noteworthly informative. We exercised numerous finger dexterity skills and techniques, while apply composition and theory. At times, he would disclose stories of composers he had acquaintances with, and demonstrated their technique, style, and personalities. Mrs. Toutorsky would not allow me to leave without giving me a gift from Russia. Nor would Dr. Toutorsky would allow me to leave without sincere encouragement, grace, and love for playing the piano. To this day, I truly miss them both, and hold a special place in my heart for him as a person (which seemed to be in a 7 foot tall frame), also his passion for classical music. John Wesley Reed Jr. Thank you, JWR, jr. for your lovely and thoughtful comments. I hear from people occasionally who write in about their experiences with the Toutorskys. One woman noted that she was a “little in love with Basil Toutorsky. I discovered a few years ago that there is a scholarship fund in their name at Johns Hopkins/Peabody Conservatory of Music. I have always thought that contributing to that fund in some way during one’s legacy planning would be a wonderful way to thank and remember them. They were the gentlest and kindest people that I have met. At the early age I was taken under their wing, I really benefited from it–and regret not going back to visit them when I was older. It would be so nice to have a recital performed by a few of Dr. Basil Peter Toutorsky’s former pupils. If anyone has any pictures of Dr. Toutorsky & Maria, please share them. I will actually purchase them from you. Our love to the greatest piano professors in our time. John Wesley Reed Jr.
What a great idea!! Any thoughts about where to contact them? We live in a house full of pianos (my husband rebuilds them) and we’d be happy to host this reunion! I have a copy of Professor Toutorsky’s ‘Ballerina Valse’ to share plus photos from a 1986 feature article in The Washingtonian magazine entitled ‘Inside the Great Houses of Washington: Private Homes”, if I can figure out how to share them here. I will attempt to attach several files scanned from the page of the article in the July 1986 edition of The Washingtonian magazine featuring the Toutorskys and their home. Let me know if you receive them. Thank you and may your holiday be liberating! Amazing, but as I re-read your account of coming to study with Professor Toutorsky, I happened to notice the remark that your father also worked at U. S. Geological Survey, just down the street, off of 16th, if I recall correctly, where my own great-grandfather, Charles Shaw, worked as a mechanical engineering, creating the precision instruments the scientists needed for their expeditions. This was back in the 1930s or even earlier, I guess. Surely, they would have been acquainted, and there would have been mutual, professional, respect between the two of them, I surmise. I have the original glass photographic negative of an image he proudly captured of just such equipment. With whom shall I safeguard this record? Now that I think of it, he would have been there even eariler, in the 1020 or teens. By the way, that little studio room built out of glass block walls, enclosing a gorgeous stone mantle and hearth, was finally dismantled in my day, restoring the imposing original appearance of that stunning open staircase with the expertly carved wooden gryphon pair of newel posts. The same chamber, according to the Professor, served as the personal office of none other than Golda Mier, the first Zionist Prime Minister, when the mansion was the Embassy of Palestine. This is so wonderful … I was telling a friend that I studied at the Washington Institute of Music at the Toutorsky Academy. I met the Professor and his wife when I was 11 and they always welcomed me into their privite living chambers where I would revel in the stories and the machinacle birds and all the wonders .. the Professor taught me the basics of playing the harp and I would strum it in the back room with the polarbear on the floor by his piano !! I absolutly loved them both and never really understood what a blessing it was for them to rake to me the way they did. I had kept in touch with them until about 86 or so and then I heard the Professor passed and it broke my heart that I didnt get to sa goodbye to a man who had given me soo much faith and confidence at such an impressionable age. What a wonderful human both he and Mrs Toutorsky were, she being soo butiful and elligant. She always wanted to know how my voice lessons were going and she wanted to hear what I was learning and give me pointers. They were soo dear to me then and the memory of them is very dear to me now. I may have met you back then .. I also worked as a temp receptionist for the Institute on weekends from age 15 to 17. I am so glad you wrote this and so happy to see the buildig again .. thank you so very much for sharing your expierences and thoughts about these wonderful people .. they are very much like mine. Thank you again ! !